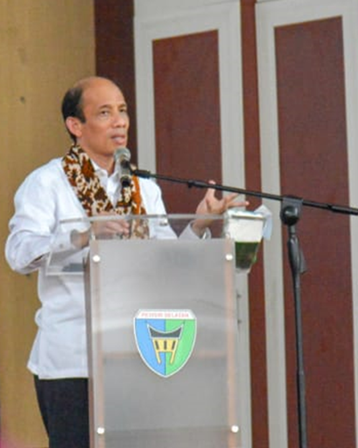 On a working visit to Pesisir Selatan District, West Sumatra, on Saturday (6/4), Deputy Minister of Energy and Mineral Resources (ESDM Deputy Minister) Arcandra Tahar expressed his support for regions that want to develop the potential of renewable energy they have, including the Pesisir Selatan. Arcandra said, the Ministry of Energy and Mineral Resources noted that the number of mixtures of primary renewable energy (EBT) which is targeted to reach 23% in 2025, until the end of 2018 reached 12.4%. "We will continue to push. As for the construction of Micro Hydro Power Plant (PLTMH), Hydroelectric Power Plant (PLTA) and several other types of renewable energy we will continue to encourage it. We see what potential is in the region, which will be developed," said Arcandra at Painan Convention Center, Pesisir Selatan District. The process of transferring the use of fossil-based energy sources to EBT in Indonesia according to Arcandra requires time such as in European countries and China. "In time, fossil-based energy sources will be replaced by renewable energy sources," he said. For information, by the end of 2018, the primary energy mix of electricity generation is still dominated by coal as a cheap energy source. In addition to making the price of electricity affordable to the public, this is also to drive the economy so that the products produced can compete in the world market. On that occasion, Arcandra also conveyed the achievement of the national electrification ratio which had reached 98.3% by the end of 2018. According to him, the figure had increased from year to year, targeted by 2019 the electrification ratio would reach 99.9% so there would be more people who can enjoy access to electricity. Pesisir Selatan District Head Hendrajoni welcomes Arcandra's support for EBT development in his region. He mentioned some of the energy potentials of Pesisir Selatan, one of which is based on hydroelectric power plants. The hope is that this potential can be developed so that community electricity is fulfilled.